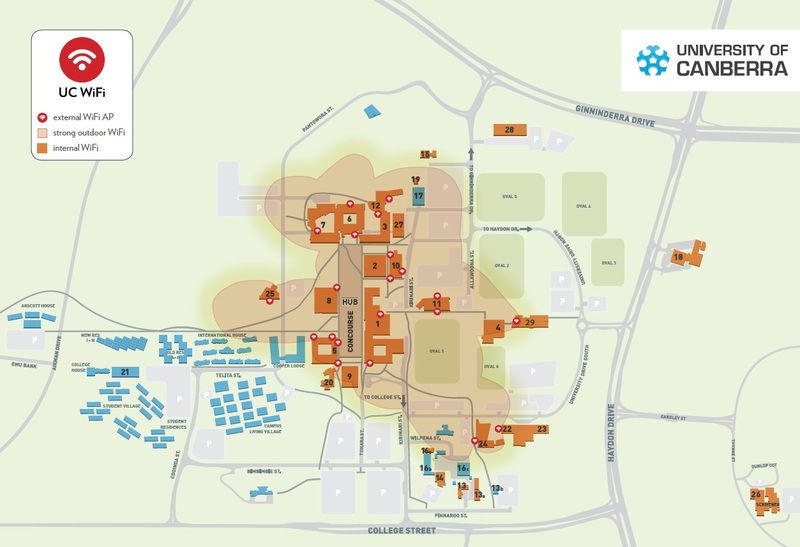 The University of Canberra provides internal WiFi within a number of its campus buildings and numerous WiFi Access Points to provide WiFi connectivity outdoors and within the vicinity of WiFi Access Points. The map below illustrates which buildings have internal UC WiFi coverage and our outdoor WiFi coverage. Acsess to UC WiFi is available in buildings 1, 2, 3, 4, 5, 6, 7, 8, 9, 10, 11, 12, 13, 13a, 14, 15, 16a, 18, 19, 20, 22, 23, 25, 26, 27, 28 and 29. Strong WiFi coverage should be experienced around all campus buildings with the exception of buildings 13, 14, 15, 16a, 16b, 16c, 18, 26 and 28 where signal strength may be low or not present. To connect to UC WiFi, go to 'Settings' on your device, and choose WiFi. Choose the WiFi service eduroam. You will need to enter your University of Canberra email address and password. University of Canberra staff & students are encouraged to use the eduroam WiFi network on campus. This will work on all other eduroam connected universities. Login to the student portal and view detailed instructions. Login to the staff portal and view detailed instructions. Choose the WiFi service UC-Visitor. If you have not used the service before, you will need to click on the 'Register' button. Enter your email address and create a username and password. The University of Canberra staff who runs events on campus are able to utilise the UC-Events WiFi network. Please contact servicedesk@canberra.edu.au to register for an account and indicate the duration of the event and the approximate client numbers. Once you have received the account information, choose the WiFi service UC-Events.